This research is motivated with the lack of optimal public services in village offices in the Karangrejo sub-district, which is related to the principles of good governance, including accountability, transparency and participation. Theoritically, the application of accountability, transparency and good participation will produce good public services. Further, the basic principles that can be applied in government to improve public services are accountability, transparency and participation from the community. The purpose of this study is to analyze the effect of accountability, transparency and participation on public services quality in the Village Offices of Karangrejo Subdistrict. This study uses a quantitative approach. The type of research used in this study is the correlation with the sampling technique using cluster sampling where all samples from the entire village office of Karangrejo Subdistrict. The sample in this study amounted to 58 people using the Slovin formula for sampling in each village. Data collection used by the techniques of using questionnaires. The analysis technique used is OLS. Firstly, the data is tested by testing of the validity, reliability and classical assumptions. Based on the results of the study it can be concluded that there is a significant influence of accountability, transparency and participation on public services both partially and simultaneously. Based on the conclusions of the results of the study it is recommended for both public and private organizations to always pay attention to the principles of good governance, if the principles of good governance can be implemented and achieved well it can improve public services. And for the next researcher, it is better to be able to study more variables related to good governance such as effectiveness and efficiency, legal rules and responsiveness that have a significant effect on public services by conducting research at the district level. GUNAWAN, Hamzah; FAISOL, Faisol. Analisis Determinan Kualitas Pelayanan Publik. JAE (JURNAL AKUNTANSI DAN EKONOMI), [S.l. ], v. 3, n. 2, p. 81-91, sep. 2018. ISSN 2541-0180. 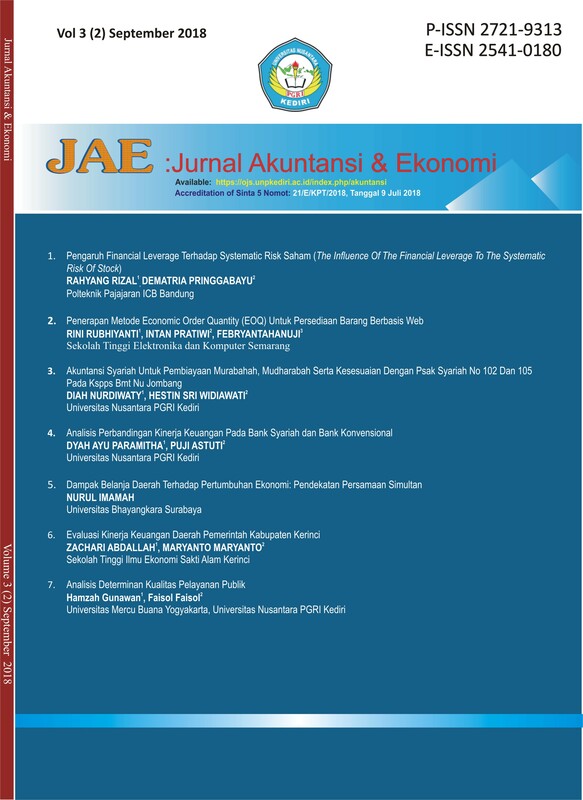 Available at: <http://ojs.unpkediri.ac.id/index.php/akuntansi/article/view/12510>. Date accessed: 24 apr. 2019. doi: https://doi.org/10.29407/jae.v3i2.12510.